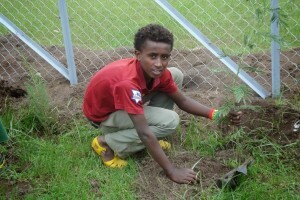 16-year-old Mitiku plants a tree at the opening ceremonies of ISAPSO’s newest community centre for children. On a recent trip to Ethiopia, CFTC’s Amboka Wameyo, Regional Program Manager – Africa, met a young man who embodies the unique and multiple benefits that CFTC’s child sponsorship program offers to children, their families and their communities. Mitiku, aged 16, has been sponsored through CFTC local partner, ISAPSO, for six years. 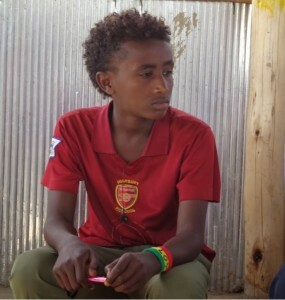 Now in the ninth grade, he and his two younger siblings (brother Temesgen, age 12 and sister Etalem, age 14) struggled after their father died. Mitiku’s mother had few skills and although her husband had run a successful business, she had no way to raise the capital required to keep it going. With no income, she could not support her young family and had few prospects in sight. ISAPSO – Integrated Service for AIDS Prevention and Support Organization – had just established a sponsorship element to their existing programming in Chancho and Sululta Townships, north of Addis Ababa, Ethiopia. A long-time local partner of CFTC, ISAPSO is deeply embedded in these communities, working to support preventative health, children’s rights, gender equity and HIV/AIDS education. A moment of reflection during conversation with CFTC’s Regional Program Manager, Amboka Wameyo. Like many who enroll a child in CFTC sponsorship, the benefits are felt by the entire family. With Mitiku’s school expenses being covered by sponsorship, meager resources could be shared with younger children to enable them to attend school as well [both of Mitiku’s younger siblings are now also sponsored]. The choices that impoverished mothers like Mitiku’s need to make – whom to feed? whom to send to school? – are truly heart-wrenching. Child sponsorship helps to alleviate the burden of making those impossible decisions and the distress and long-term negative effects they cause. Sponsorship also benefits the broader school community. Sponsorship donations fund services that are delivered through primary schools and early child care and education (ECCE) centres. 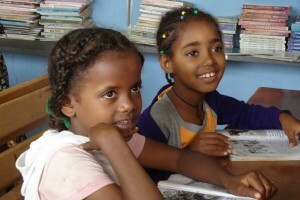 This typically means that schools with sponsorship programs receive classroom equipment like desks and teaching supplies, and sometimes even the classrooms themselves; school latrines which are so critical for disease prevention and proper hygiene; and water tanks which offer the added benefit of minimizing the amount of time that girls, especially, need to spend in the ime-consuming and frequently dangerous activity of collecting water. While the sponsored child receives extra direct support for education and proper nutrition, she or he also becomes an “ambassador” bringing the generosity of child sponsors to their schoolmates. A well-equipped lending library benefits the whole community. In almost every CFTC child sponsor program offered by our local partners, funding from sponsorship also supports health status monitoring which is offered to all children; in-school feeding which often includes salaries for school cooks and kitchen equipment as well as the meals themselves which are made available to every child; and teacher training and recruitment – vital to ensure that children remain engaged and gain the skills and knowledge they need to graduate. In the midst of his Scout troop – Mitiku has emerged as a strong leader, with a strong sense of civic pride and duty. Sponsorship extends a network of support to encompass children’s parents, too. CFTC partners who run child sponsorship programs commonly offer information sessions on children’s rights, positive parenting, health and hygiene, nutrition education and many other topics, and encourage parents of sponsored children to attend. CFTC’s local partners, including ISAPSO, work to empower and build skills of the most impoverished parents in their communities – in the majority of cases, mothers heading single-parent households – by offering business-skills training, access to credit and start-up loans, and social support through Self-Help Groups and Village Savings and Loans Associations. While Mitiku was receiving educational support to be successful academically, his mother was learning the skills she needed to keep her business alive. Mitiku’s mother is now able to earn an income as a vendor, having gained not only skills but the confidence to create a better life for herself and her children. She has inspired Mitiku, who dreams of growing up to be “in business like my father used to be and like my mother is. I want to extend the family business. 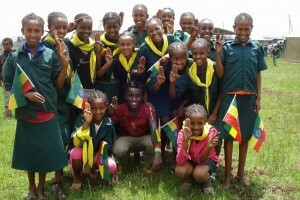 My dream is to innovate, to create something new in the business world.” An achievable goal for Mitiku, who (despite his remarkable leadership abilities), is an otherwise typical kid, and a perfect example of how children can blossom with sponsorship help from within their own community…and from half a world away.